Little Big Town’s lyrics were stuck in my head as the week began. It really didn’t matter how worried and out of sorts we felt (did you read last week's post?) "Life rolls on" and there were things to do. There is often no time like the present and some jobs cannot wait until we are in the mood to do them. Such was the case for nearly everything on the week’s to-do list. 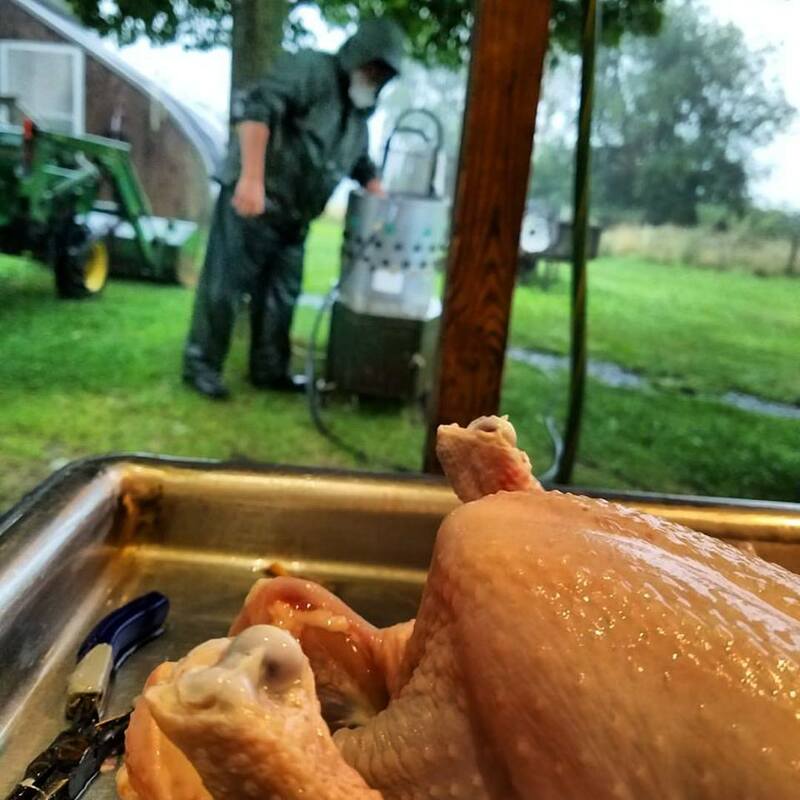 Monday was broiler processing day, regardless of the weather. We had momentarily considered changing up when Sunday’s review of the weather showed a good chance of rain. But, that would have meant more than a little logistical juggling. Much of the week could NOT be re-scheduled. And, how bad could the rain be, anyway? I must admit, we had some serious second thoughts when we got ready to begin. But, by then we were committed. In preparation for processing, the broiler’s feed had been removed Sunday afternoon, the scalder was full of water and everything stood at the ready. It took a little soggy teamwork, but we got the batch done in record time. (we just get faster and faster) It looked like the week was off to a good start. even a rain-suit didn't keep him dry! Ironically, the rain ended just as we finished and we were able to get to the rest of the regular Monday jobs in the afternoon. While I was doing afternoon chores, I got the phonecall that changed everything. Did you read THIS? Neither one of us could believe that news. The whole experience seemed more than a little surreal. Now, we will have to wait and see what happens at the Boss’ scan at the end of October. But, for now, we can relax...and get back to work. I realize that sounds more than a little oxymoronic. Tuesday’s to-do list was fairly full. First, the broilers needed to go in the field pen so we would be ready for the chicks arriving later in the week. We needed to get them situated in the field pen before we could focus on the bigger job. August means it is time to start working on Project Lambchop for the following year. Working on “project lambchop” means that the ram (in this case, Angus) needs to be turned in with the ewe flock. However, it is not simply a matter of opening the gate. (although I suppose you could use that approach) A little advance preparation provides the best outcome. Before we could let Angus have his way with the ladies, there were a few other things that needed our attention. We ran all the ewes to the barn, sorted out the ones to haul and de-wormed the rest. This will assure that they are as healthy as possible as breeding season starts. The next step in the breeding process would have to wait until we returned from town. A quick trip to the stockyard went off without a hitch. That’s always a good thing! One part of the project completed, we made guesses about just how much the “old hay-burners” might bring. It’s never a whole lot, but it beats paying to feed them. We wouldn’t know for certain until we got the check from the stockyard. The next part of the project was to get Angus ready for the big intro. He was outfitted with his marking harness and de-wormed. THEN we opened the gate. Project Lambchop 2018 was underway! ...and that was pretty anti-climactic. We left any future lambchop production in Angus’ capable hooves. He knows what to do and when to do it, so we could check another project off the list and go back to harvesting zucchini (and other stuff). Eventually it dried out enough for the Boss to get the tractor in the garden. By tilling and hilling the potatoes, he keeps the weed pressure down (at least a little) and allows the tubers room to grow under each plant. They will be ready for harvest sometime in October. The rain really made a big difference in the garden. Check out these beans! For the first time in many years, we haven’t had great lettuce production. Between the heat and the bugs...and my ongoing neck pain, the greens have suffered greatly. (read...there is NO lettuce) And, while our customers are getting more than a little anxious, I must admit, it is nice not to spend the entire day bent in half picking lettuce leaves. On our way out, we picked up the mail which included the check from the stockyard for the culled ewes. Before opening the envelope, the Boss likes to guess the amount. He made his guess. I peeked inside. WOW! Once, years ago, we took a poor, pathetic sheep to the stockyard and got a whopping $9. I kid you not. $9. That experience is always in the back of our minds as we haul sheep to the sale. This check was for more than nine dollars. A whole lot more than nine dollars! We got nearly a dollar a pound for old culled ewes. That was nearly THREE times what we had anticipated when we dropped the old ewes at the stockyard. What a great surprise! It was nearly enough to cover the monthly feed bill. Which, coincidentally, arrived in the same mail delivery. Still rejoicing about the “big check”, we stopped by Subway to pick up lunch. (lunch dates around here are never fancy) More rejoicing when we found we had accumulated enough points for a FREE lunch! All in all, a pretty good Friday! As the ground slowly absorbed Monday’s torrents, it was still pretty soggy. And, every day held the chance for more rainfall...the forecast did not look good for Saturday’s Market. Other than a few sprinkles, the weather held, the people came. And, we had a great day. (even without lettuce) There were a lot of hugs and much rejoicing with our customer-friends over the good news from early in the week. I am not exaggerating when I say that the love and support we get from the Market truly keeps us going. These folks are the best…the absolute best. If you can’t get to the Market, at least you can visit virtually… Click HERE for the Boss’ photos for the week. You know, this was probably the best week we have had here on the hill in quite some time! Thanks for stopping by. Come back and “visit” real soon. And, THANK YOU for the outpouring of love and kindness. P.S. I think I would be remiss if I didn’t make some mention of the events that took place in Charlottesville yesterday. Sadly, our beautiful state made worldwide news, and not in a good way. Read this. I find everything about this deeply disturbing. My family goes way back in Virginia history. Nearly 400 years. Those names in the family tree appear in history books and on landmarks all around the area. For better or worse, Virginia wouldn’t be what it is without those names. The fact that there are people who use the past to promote their continued current agenda of racism, bigotry and hatred simply breaks my heart. I have no idea how this should be addressed. I have no idea if the divisiveness and troubles of society can be resolved. But, I think we can start here. I leave you with "Pray for Peace" by Reba McEntire. All in all a good week Barbara - we are all thinking of you both. As for the events you mention. Yes of course they were on TV - it is very distressing - we are all the same under the skin and we must learn to live together. You are so right...I just wish everyone understood that. Distressing may just be an understatement. ahhhh, Always love the updates! All your produce looks wonderful. I swear, I am going to do a road trip one day and come visit you guys. I would love to help you out just once! lol. of course, since I know nothing about farm work, you may kick me out at the end of the day, haha. I have no words for those fools in Va. In this day and age...shameful! disgusting! I just can't!